If you haven’t, do yourself a favor and go check out the site. Then, sign up for a basket if they have a location near you. It is SO worth it. The way it works is, a bunch of people get together at a location (we have one in our town, some towns may have more- it’s all volunteer run) and contribute money towards produce. $15 gets you a conventional basket and $25 gets you an organic basket. The more people that contribute at your site, the more produce you get in your basket. The produce isn’t always local to your state, so this isn’t like a CSA in that respect, but it’s similar to shopping at the grocery store, except you usually get twice as much produce for the money. It is like a CSA in that you don’t know what you’re going to get in your basket. So if you don’t like trying new things, this isn’t for you. Contributions occur on the monday/tuesday before your basket pick-up, and baskets are usually bi-weekly. I’d actually heard of Bountiful Baskets a couple of years ago, and then didn’t participate until this year. And I’m so glad I finally did!! I get SO much produce every week, and I LOVE their bread add-on options (they have lots of items you can add on- bread, granola, coconut oil, cookies…it varies by site, so go check them out!) The bread is great because there are very few ingredients in it (and I can pronounce every single one of them!) A lot of store bought bread has dairy/soy in it, and this doesn’t- it was a great way to introduce grains to B without worrying about extra additives. Blah blah blah- enough about that- want to see my basket this week? Not bad for $15, right?? 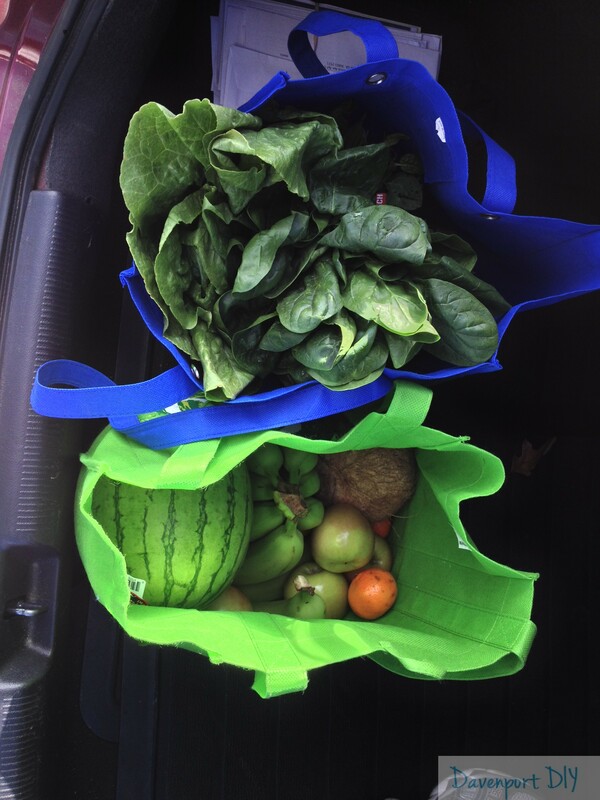 I pick up my basket at 9:30 in the morning on Saturdays (you have a specific window in which to pick up your basket, and you need to bring your own bags or basket to put your produce in), and I head to the grocery store directly afterwards. It’s nice to be able to cross off a lot of the produce that’s on my grocery list! Now, sometimes I get things that are a little…odd. Things I wouldn’t normally buy at the store- but that’s half the fun!! This time I got a coconut, and the time before I got persimmons and fennel (the fennel I sliced up and roasted with some cauliflower and broccoli and it was very tasty). A few baskets ago, I got some pomegranates. Then they sat and sat on the counter, waiting for me to deal with them (luckily they are a patient fruit). All the colors were so pretty together- a perfect fall dish. I crossed my fingers that it would taste half way decent- and it didn’t disappoint!! Yum. 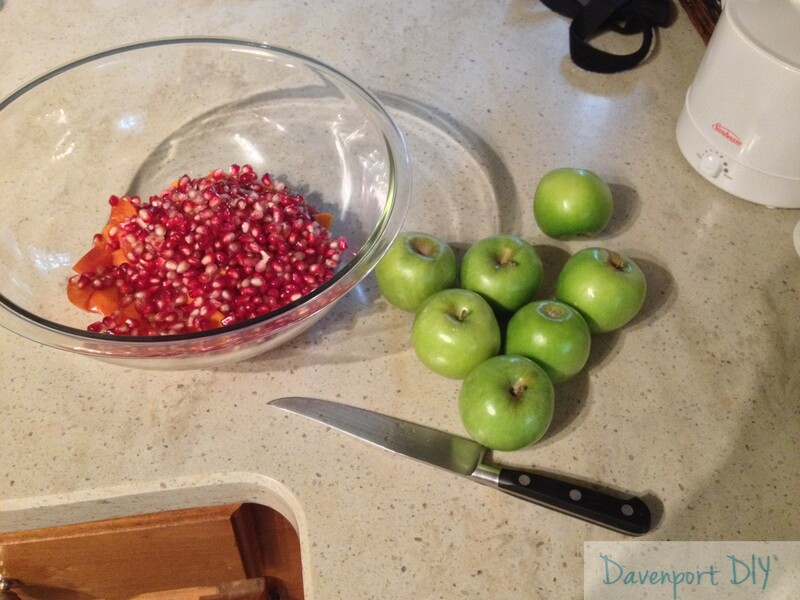 It turned out great- I really loved the crunch that the pomegranates added to the dish. Even B liked it!! He was a little grumpy towards the end of dinner until I put a small spoonful of this in his mouth- he asked for more a few times. I’m so happy to have found Bountiful Baskets– if you have a site near you, definitely check it out. If you don’t like the experience, you never have to contribute again, so what is there to lose?